I don’t like to play favorites with my yoga poses, but I must say that I am a big fan of backbends, especially Cobra pose and its many permutations. I just really like how it makes me feel strong, energized and spacious. But that wasn’t always the case. Many years ago, when I was a young and inexperienced practitioner, I would get this persistent pain in my mid back right around my spine every time I attempted Cobra. This was rather unsettling. But then after careful exploration under the watchful eye of an experienced teacher I discovered that in my effort to go deeper into the pose I was creating a pivot point in my spine, bending at one specific place and reinforcing it by extending my arms. This is generally not a good idea since it both causes pain in the back and gradually weakens the area. So I had to retrain myself on how to do backbends and now I can enjoy all the benefits they have to offer without any of the risks. – compromising stability in the joints for the sake of excessive mobility. As a result we might end up with an anga bangha practice – it’s when you have good intentions to do something positive for yourself but end up hurting something else in the process. Cobra pose is a perfect example of a good thing that often goes bad – it can be incredibly helpful for relieving lower back tension or it can create it, depending on how you do the pose. The trick here is to work smarter, not harder. I know, I know, we are conditioned to work harder and believe that this is how we achieve progress. In this case, trying too hard is counterproductive. To work smarter we need to acknowledge our starting point and be clear about what it is we are trying to accomplish. We also need to be on the lookout for the habitual movement patterns that will inevitably creep in and will try to mess up our best intentions. Identifying those habitual patterns (or release valves, as we call them) in different movements help us keep the body safer, accomplish the goals we are after more effectively and avoid all the potential problems listed above. I had previously taught a webinar for Yoga U dedicated to identifying and correcting the release valves in forward bends and twists (you can find it here); and now I am excited to give the same attention to backbends and lateral bends. Both of those categories contain body movements that we do not do in our daily lives (how often do you bend sideways in the course of your day? ), but they are essential to keeping our spines supple and mobile. Both backbends and lateral bends make us feel stronger, more powerful and more receptive toward things that come our way; they help build our energy when necessary; and they strengthen our backs and support better postural alignment – so if any of those things sound good to you, you will benefit from befriending those poses. So sign up, join in and we’ll investigate those together. You will have an opportunity to ask questions at the end and you will also get a video of a 40-minute exploratory yoga practice that illustrates the points I make during the presentation. Here is more info about the webinar. 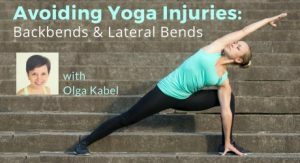 Two webinar sessions (2 hours) where I will demonstrate how to identify the alignment mistakes that can compromise yours or your students’ safety and diminish the effectiveness of backbends and lateral bends. 40-minute exploratory yoga practice that will show you how to introduce proper back bending and side bending technique to build a solid foundation for future exploration. Recordings of all webinar sessions: You will get access to the recordings of all webinar sessions, enabling you to go back and listen to the workshop as many times as you like. Transcripts of all sessions: With the transcripts of the webinar sessions, you can go back and refer to particularly important passages or clarify sections you were in doubt about. Next story Do your beliefs hold you back or propel you forward?